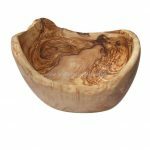 This gorgeous olive wood bowl has been cut from the cross-section of a branch, giving it a lovely natural edge and also a stunning grain through the centre. This rustic olive wood dish is suitable for serving food and will not taint any food which is put in it, nor will food damage the bowl. 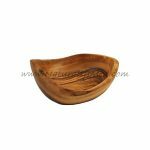 You could also use this wooden bowl for storing keys, jewellery or even pot-pourri. In fact this bowl is so beautiful you could just use it as decoration! This bowl is rustic in design and handmade, so each one is unique. Diameter is approx 5.5″, height is approx 1.6″. 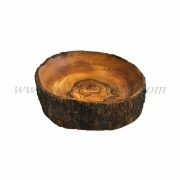 As the bark edging is a natural feature it will vary from bowl to bowl.